We are proud to announce the eighth Central European Seminar on Computer Graphics for students to be held in Budmerice (together with SCCG 2004) in late April, 2004. This international seminar is a continuation of CESCG '97, CESCG '98, CESCG '99, CESCG 2000, CESCG 2001, CESCG 2002, and CESCG 2003, and previously held joint seminars. CESCG is organized by the Institute of Computer Graphics and Algorithms, Vienna University of Technology, and the Department of Computer Graphics and Image Processing, Comenius University, in Bratislava. The seminar is again organized under the auspices of His Excellency Martin Bolldorf, Austrian ambassador in Slovakia. The main sponsor is SOFTIP company. Please note that active participation with paper and talk must be announced via email to cescg#cg.tuwien.ac.at until December 4, 2003. Otherwise an active participation will not be possible! See below for more details about the procedure of registering presentations at CESCG. Additionally, participants who just wish to attend the presentations and discussions are kindly invited. A registration fee of Euro 40,-- (to be paid directly at the seminar in cash) is requested from (inactive) participants, i.e., seminar attendees who do not present a paper or supervise presenters. 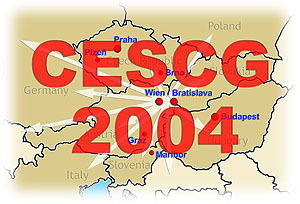 CESCG is planned to be held in Budmerice at the end of April 2004. Students have enough time to arrive at Budmerice on the first day (in time), even from the far locations. There are approximately twenty-four talks (including time for discussions) scheduled for all three days in total. The program of the seminar is divided into morning and afternoon sessions. Time for lunch and coffee breaks is reserved as well. After the first and second day of the seminar, there are social programs in the evening, e.g., going to a pub, and a possibility to sleep in Budmerice. The seminar language is English, i.e., CESCG papers are written in English and presentations are also given in English language. Active participation in the form of a published and presented paper has to follow the following process: first a certain set of computer graphics groups in Central Europe are invited to participate through an according dissemination of the call for participation. Then, until the first deadline, invited groups announce their active participation to the CESCG organization in Vienna via mailto:cescg#cg.tuwien.ac.at: groups tell the number of presentation slots they would like to fill at the seminar (one, two, three, or even more). Due to the limited number of talks at a CESCG seminar (up to 24 talks or so), only one or two slots per actively participating group can be guaranteed from the beginning on. After the first deadline, and according to the total of all talk announcements, the Vienna part of the CESCG organization compiles a so-called preliminary program which states which groups can send how many students for active presentations. Then, until the second deadline, students prepare their CESCG papers and submit them for reviewing to cescg#cg.tuwien.ac.at. After reviewing, CESCG students incorporate the reviewers' recommendations for improvements into their papers and re-submit the improved papers for final publication. Papers eventually are published in printed form (printed proceedings), electronic form (on CD-ROM and as web proceedings), and as presentations directly at the seminar. The contributions are submitted in some directly printable format for printed proceedings (device-independent Postscript or PDF) and the paper source (LaTeX). To ensure some typographic quality of the seminar proceedings, all submissions have to follow the guidelines for authors available at http://www.cg.tuwien.ac.at/studentwork/CESCG/guidelines/. A LaTeX2e class (implementing these guidelines) can be downloaded from this web-page. Students are highly encouraged to include additional material in their submissions. This additional material can be images, animations, ..., and should be assembled on an HTML page which will be included in the electronic proceedings on the web and the CD. Note that only those contributions are included in the seminar proceedings, that conform to the guidelines specified above and which are submitted in time according to the schedule of the seminar. October 29, 2003 Call for Participation sent to invited groups. Invited groups need to check of whether they want to actively participate in CESCG and if so, how many students they would like to send. December 4, 2003 Deadline for email-announcements of participation. Invited groups announce how many students they would like to send for active participation with paper and talk (names and titles not necessarily known at this time). No more than one (or two) talks can be guaranteed all from the beginning on due to the increased number of invited groups. December 19, 2003 Preliminary Program sent to participants. The preliminary program tells which groups send how many students to the seminar. February 5, 2004 Reviewing Submission Deadline. For reviewing purposes, two versions of the papers should be submitted: one regular one and a second one without names and affiliation (anonymized). Submission details will be available on the web page in time. February 20, 2004 Reviews sent to authors. The authors of prospective CESCG papers receive constructive recommendations of how to improve their papers from reviewers from the IPC. March 3, 2004 Final Submission Deadline. By this day, all contributions, reviews worked in, must be submitted. Note that this year only a printable version (Postscript or PDF) of the contribution must be submitted. However, students are highly encouraged to provide additional material in form of images, animations, ..., assembled on an HTML-page. Again, submission details will soon be published. March 26, 2004 Final Program will be sent to participants. The final program lists all CESCG presentations with names and titles as well as the date and time of all talks as well as additional parts of the program (social program, etc.). April 4, 2004 Registration deadline. CESCG participants need to register electronically until this deadline for regular attendance at the seminar. April 19 - 21, 2004 CESCG 2004 will take place in Budmerice castle. In case you have any questions or recommendations, please send an email to cescg#cg.tuwien.ac.at. CESCG 2004 is organized by Ivan Viola, Helwig Hauser, and Andreas Traxler in Vienna and Andrej Ferko and Marek Zimanyi in Bratislava. This CfP is available via URL http://www.cg.tuwien.ac.at/studentwork/CESCG/CESCG-2004/cfp.html. Pages that provide general information about CESCG, guidelines for the authors, etc., can be reached via URL http://www.cg.tuwien.ac.at/studentwork/CESCG/. and looking forward to another great CESCG, next year.